This post was originally published on September 28, 2010. It has been updated and reposted for readers’ enjoyment. You might not think that growing up as I did in a tiny southern town would afford one many social gathering opportunties. Oh, how wrong you’d be! We used every possible opportunity to get together with family, friends and neighbors. We had teas and showers, club meetings of all kinds, even church services became a social get-together. And no social gathering was complete without food of some kind. There were very specific foods for each type of occasion. Teas and showers called for little finger sandwiches, cheese straws and petit fours. Club meetings might mean dips and chips with a selection of soft drinks. But one of the most fun gatherings was a bunch of friends and neighbors getting together for a good old-fashioned fish fry. Most south Georgia fish fries back in my day were impromptu events prompted by a lucky fisherman having a good day on the water. The catch in our area was typically either bream or catfish. After the day’s catch was cleaned, the call would go out to friends that a fish fry was being prepared. You just can’t beat Fried Catfish with Cheese Grits! Now, if you weren’t the fishing type or you just had a craving for some fish in between one of those occasions, you could always have that craving satisfied at one of the local fish camps. I remember Mama and Daddy loading up me and my sisters in the station wagon and heading for Pace’s Fish Camp. Pace’s, like every other fish camp around there, was not a fancy eating establishment. In fact, it was the complete opposite of fancy. As I recall it from the late 60’s, there were probably six tables each with six straight-backed wooden chairs around each – the kind that made that screeching noise when you pulled them across the floor…you know what I mean. No tablecloths, of course, and a roll of paper towels on each table. Like I said, not fancy. It was really difficult for me to write measurements for this recipe since I’ve never measured any of the ingredients. Like many home cooks, I just do what “looks right.” So use the measures as a guideline and add more or take away if you think you need to. 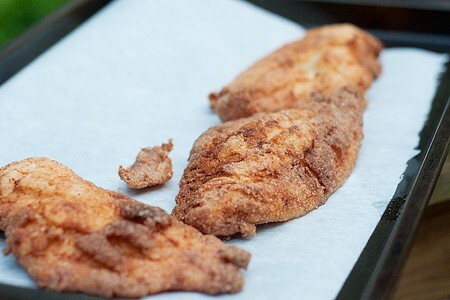 Rinse the catfish fillets under cold water and place them in a shallow baking dish or pan. Add enough milk to cover fillets. Cover the dish and refrigerate for approximately one hour. Remove the fillets from the refrigerator about 10 minutes before ready to cook. 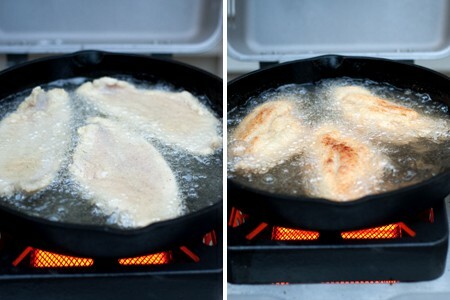 Place a large cast iron frying pan over high heat and pour in peanut oil to a depth of approximately 1 1/4 inch. Allow the oil to come to frying temperature while preparing the fish. Combine the cornmeal and salt in a shallow pan. Some cooks like to add a bit of cayenne with the cornmeal. If you like that sort of thing, then go for it! Remove the fillets from the milk letting most of the excess drip off. Place one fillet at a time into the cornmeal, gently turning the fillet several times until it’s coated well. Prepare all the fillets before you begin frying. I often do my frying outdoors on the side burner of BeeBop’s gas grill. It eliminates the lingering fishy-greasy smell in the house and any splashes and pops were much easier to clean up. Carefully lower the fillets, one at a time, into the hot oil. Don’t crowd the pan. Instead, fry in several batches if necessary. Turn the fillets when golden brown on one side. Cook on the second side until nicely browned as well. Return the fillets to the first side to cook for an additional minute or so if needed to fully develop a golden brown color. Remove the cooked fillets to a baking pan lined with parchment paper and keep them warm in a 200 degree oven while you finish cooking. For a traditional fish fry menu, serve your golden brown and crispy fried catfish with cheese grits, coleslaw, french fries and hush puppies. 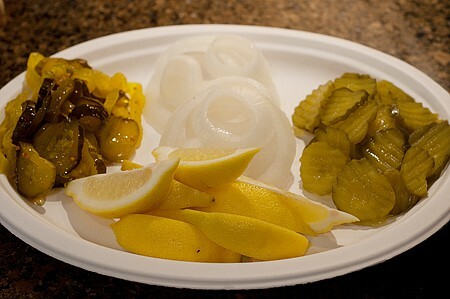 And don’t forget the traditional accompaniments of onion, lemon slices and pickles – both sweet and dill. 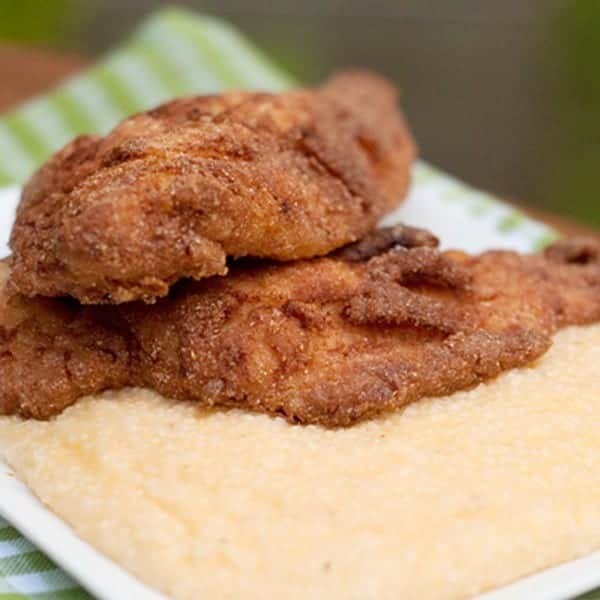 Add speaking of cheese grits…no southern fish fry would be complete without a pot full of creamy, cheesy grits. And, wouldn’t you know it, I just happen to have a recipe for you. It was one of the first recipes I ever posted here on the blog and it’s still a good one! Visit my original post on Cheese Grits for that recipe. Catfish fillets, coated with cornmeal and fried to a crispy golden brown. 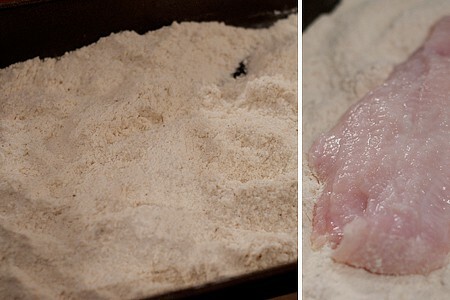 Rinse catfish fillets under cold water and place in a shallow baking dish or pan. Add milk to cover fillets. Cover the dish and refrigerate for approximately one hour. Remove the fillets from the refrigerator about 10 minutes before ready to cook. Place a large cast iron frying pan over high heat and pour in peanut oil to a depth of approximately 1 inch. Allow oil to come to frying temperature while preparing the fish. Combine the cornmeal and salt in a shallow pan. Remove fillets from milk letting most of the excess drip off. Place one fillet at a time into the cornmeal and turn it several times to coat well. Prepare all the fillets before you begin frying. Carefully lower the fillets, one at a time, into the hot oil. Don’t crowd the pan frying in several batches if necessary. Turn the fillets when golden brown on one side. Cook on the second side until nicely browned as well. Return the fillets to the first side to cook for an additional minute or two if needed to fully develop a golden brown color. Serve with cheese grits, coleslaw, french fries and hush puppies. It was really difficult to write measurements for this recipe since I’ve never measured any of the ingredients. Like many home cooks, I just do what “looks right.” So use the measures as a guideline and add more or take away if you think you need to. I’ve never had catfish- would love to try yours! Still on the fence w/ grits though. I’ve had a couple of icky versions and a couple of versions that were so tainted w/ cream and cheese that I’m not sure you could even taste any of the grits lol! Lori – I think the most important thing about grits is to make sure you get a brand processed in the deep South. I know Quaker is probably the most widely distributed and they’re a great company, but they just don’t have those southern roots :-) A regional southern brand like Jim Dandy is much the best. And, you’re right, grits don’t really need loads of cream. As a matter of fact, I don’t use cream in mine at all. A reasonable amount of butter, salt and pepper is really all that’s needed. That lets the taste of the grits shine through. They’re just ground corn, you know, very similar to polenta if you think about it. I first had catfish when I lived in KY in the late 70’s and I haven’t had it since. It’s time to make it again don’t you think? I never heard of the term “Fish Camp” it sounds like a diner that only serves fish. I think I would’ve loved that. And cooking on the side burner….what an idea. I’m glad you think outside the box because I sure never do. Thanks. I grew up in a small, rural Georgia town also and catfish was a staple — always easy to catch either in the creek or the pond. I don’t use milk but otherwise recipes are very similar. Thanks for sharing! Ooooh, this really resonates, brings longings of home, and sounds delicious. We never had grits at our fish fries (but sure why not) we always had french fries, coleslaw, and hushpuppies. And yes to the pickles, onions, and lemons. Cheese grits and catfish sounds mighty good. Hi Lana…just wanted to let you know that I featured your 8 ball zucchini post on my blog today for my Tasty Tuesday post! I made it last Thursday and have been craving, drooling, dreaming about it ever since! Good thing I have a few more 8 balls that are ready to pick!!! I love fried catfish thou i never fried it with cornmeal. such a great idea! I haven’t made catfish in a little while now I’m craving it. We ate so much of it when I was a kid. We fished at least once a week, and if we didn’t have money for meat, out to the pond, to catch dinner. I use to complain to my Grandma and she would say at least your daddy doesn’t make you eat squirrel, rabbit and possum the rest of the days of the week. My how food stamps have changed the lifestyle and culture of the poor. OK, when you have a post like this you should be required to send out samples! I can just taste it! Living in Savannah, Fried catfish and cheese grits rule! Looks fantastic, Nanalana! I’ve done Scallop ‘Po Boys before, but these look like they would hit the spot. YUM! I grew up in my family’s catfish restaurant and I still love cooking up a big batch of it today. It’s a happy day when my boys bring in a big catfish to fry. This looks amazing! I need directions to your house the next time you fry up some catfish! It is defanitly a Southern Georgia staple. My Grandma lives in South Georgia and during the summers when I would visit, we would go to a wonderful lil place in the middle of no where that sounds EXACTLY like Pace’s. We went for old time sake last summer and it is nothing like it was as a kid :( Total bummer! Cant wait to fry some catfish up now. 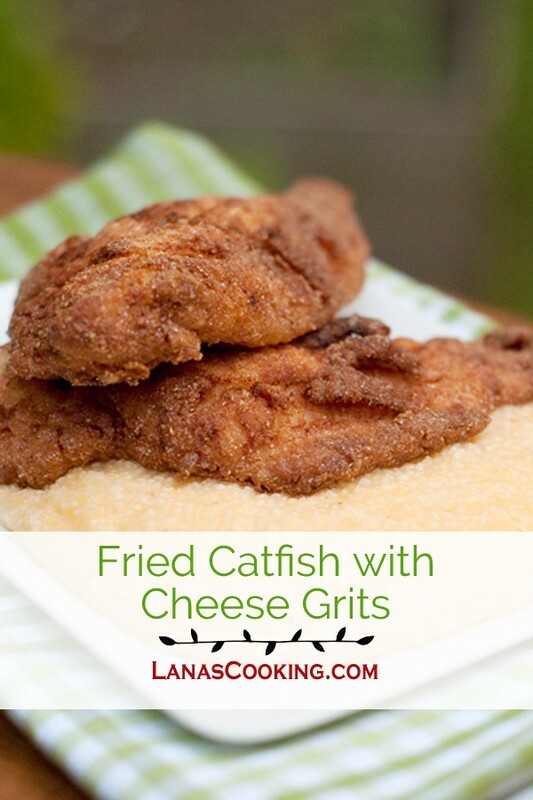 Angie – I don’t think I’ve fried any catfish since I wrote this post. It’s really past time for a fish supper around here! Next time I’ll photograph the hush puppies and do a post on them. I have a hushpuppy recipe from the 1940s that is the best. No store-bought mixes and no tiny bullets of the mix which so many restaurants serve – tasteless. It fries up puffed golden brown. I have never tried catfish but this recipe really makes me want to! Thanks for sharing. You’re welcome, Sherri! Re-reading this old post is making me want to have a fish fry! I fell in love at first bite with fried catfish on a visit to Beale St. in Memphis. :) Farmed catfish are also an excellent sustainable fish, so you can feel good about not contributing to the depletion of our natural resources. Be sure you are buying U.S. farmed fish though, the ones from Asia can have some nasty chemicals in them. In Virginia they are readily available year round. Your recipe looks great and much easier than my usual. Thanks! Is there a difference in catfish? I had catfish when in the south and it was delicious! I’ve bought it in the store here and it was the most awful tasting thing I ever had. Tried twice and both times smelled like something died. I know there are different cats, which one is good to eat? Hi Pat – I don’t know of any difference in catfish. They can have a strong taste which is the reason for the milk soak in my recipe. I soak the fillets in milk for a while to take out a lot of that strong taste. Thanks for the suggestion, Johna. I’ve passed it along to my developer and hope to have it updated soon. Thank you for another trip down memory lane. “Baby” cats at Pace’s, yum. Jewell Pace was my great-aunt and it was always a treat to drive down to the lake from Iron City and eat with her. I think its time for a fish fry. Did anyone in your family ever fix Swamp Gravy at a fish fry? I actually checked your site a couple of weeks ago to see if you had a recipe listed but didn’t see one.